Published: March 24, 2015 2:45 pm Updated: March 25, 2015 12:43 p.m. In a video that is attracting national attention, BYU students perform Bruno Mars' "Uptown Funk" with a twist: a little magic. 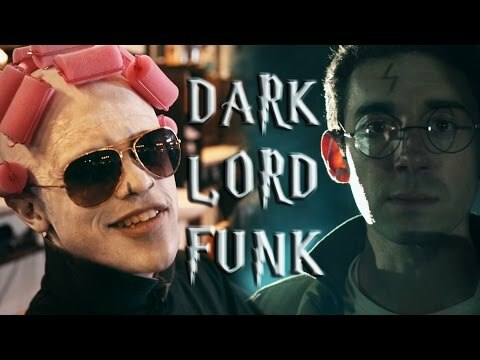 Their spin on the video, titled "Dark Lord Funk," features Lord Voldemort from the Harry Potter series. The video was posted to YouTube Wednesday and has already been picked up by The Huffington Post, MTV and Cosmopolitan. The director and producer of the video, Keith Allen, said he came up with the idea because of the line "Say my name, you know who I am" from "Uptown Funk." He revised the line for Lord Voldemort, also known as "You-Know-Who," saying, "Don't say my name. You know who I am." Allen is taking a break from his graduate studies at BYU to produce parody videos for his YouTube channel, KFaceTV. He plays Harry Potter in the video and said he is thrilled by the attention the video has received. "About Saturday night, when we had about three-quarters of it edited, we said that this was something special," Allen said. "We were all looking around super excited. It was just clicking." The video gathered over 350,000 views within the first two days of publication.